Look at those chains! He’s already more machine than man! There’s been a new Terminator movie in the works for a while now, one promising a lot of old-school Terminator 2 talent, both in front of and behind the camera. Arnold Schwarznegger and Linda Hamilton will both be back, for instance, reprising their classic roles, while James Cameron is producing, giving the film his first blessing since he left the franchise more than 20 years ago. Still, the Tim Miller-directed blockbuster is going to need at least a little fresh blood/synthetic blood substitute, which is why we’re happy to congratulate Agents Of S.H.I.E.L.D. 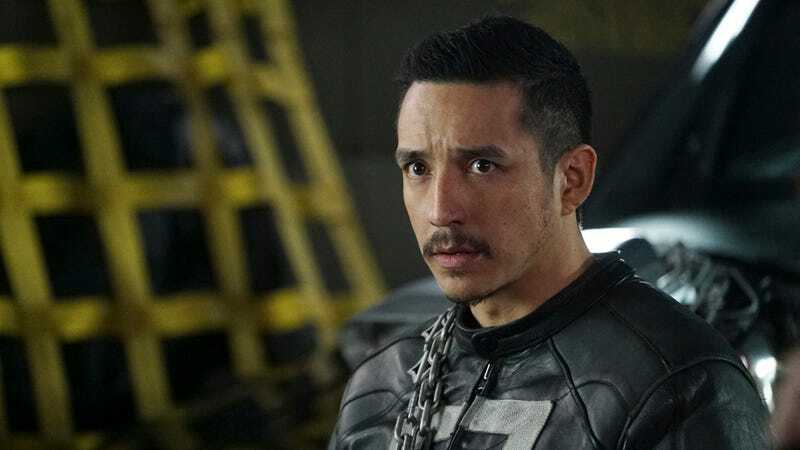 actor Gabriel Luna: You’re a Terminator now, buddy. Welcome to The Big Metal Show. As reported by Deadline, Luna—who pops up from time to time as Ghost Rider on the ABC comic book series—is joining a robotic fraternity that includes Robert Patrick, Kristanna Loken, Byung Hun Lee, Summer Glau, and a whole bunch of other T-Whatevers who won’t matter to this particular movie, because Cameron has said the movie will pretty much ignore everything that happened in the franchise after T2. Meanwhile, Luna’s not the only new cast member announced for the film, which is currently aiming for a November 2019 release date. Diego Boneta and Natalia Reyes will also appear in the movie, appearing opposite Halt And Catch Fire’s Mackenzie Davis, who was announced as the franchise’s latest star last month.